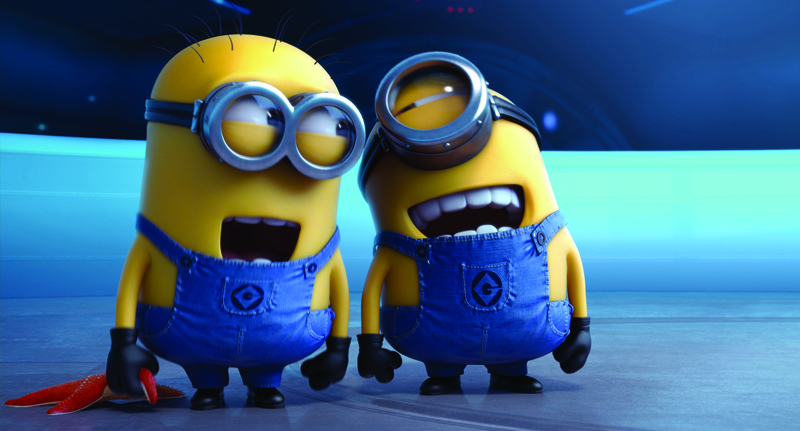 The little, yellow minions in “Despicable Me 2” are darn cute. They are so cute, in fact, that they have dominated advertising for the movie despite the fact that the plotting is centered on the exploits of their master, the kind-hearted former supervillain named Gru. In the original “Despicable Me,” moviegoers watched as Gru slowly transitioned from menacing criminal to doting father thanks to his relationship with three orphan girls. In the sequel, Gru is settling into life as a dad and hoping to start a legitimate business selling jelly and jam. The minions are happy to help, and Gru’s closest business associate, Dr. Nefario, is developing the recipes. Unfortunately, they are all really bad at being good, so their jelly is terrible. That makes it a blessing when Gru is asked to help a top-secret law enforcement organization solve a crime involving the theft of an entire Russian laboratory dedicated to the development of a dangerous chemical compound. Because Gru was once evil, the organization believes he can figure out who stole the lab and save the day. Small amounts of the Russian chemical are traced to a local mall, so Gru is asked to go undercover, pretending to run a cupcake shop. There, he and his assigned partner, secret operative Lucy Wilde, do their best to solve the crime. “Despicable Me 2” is the rare sequel that actually bests its inspiration. That may be because the entire creative team from the first movie is back. Directors Pierre Coffin and Chris Renaud are, once again, working from a screenplay by Cinco Paul and Ken Daurio, and the story is fully developed and exciting. Too often, sequels feel like little more than a rushed attempt to cash in on previous success, but “Despicable Me 2” actually furthers the story of Gru, his orphan girls and those adorable, little minions. In fact, the film moves Gru even further from his evil roots, arguing that people can change under the right circumstances. In the first film, Gru’s adoptive daughters melted his heart. In “Despicable Me 2,” secret agent Wilde plays a role. The movie is a visual feast, as the animation is crisp, colorful and exceedingly well-rendered. Most importantly, those visuals are used to further the character development of all key players. The voice cast again features Steve Carell as Gru and Russell Brand as Dr. Nefario. Their work is top notch, and it is reinforced by outstanding turns from Kristen Wiig as secret agent Wilde and Benjamin Bratt as a Latin restaurateur who may or may not be an evil genius. Coffin and Renaud even get in on the action, giving voice to the minions who speak in indecipherable, high-pitched sentences made up of words from several languages. Despite the fact that it’s impossible to understand them, the minions’ voices – like most of “Despicable Me 2” – are perfect. DVD and Blu-ray extras include two making-of features and an audio commentary by Coffin and Renaud. It’s impossible to comment on “Fast & Furious 6” without acknowledging the tragic, Nov. 30 death of Paul Walker. Although the long-running auto-racing franchise has numerous stars, Walker was the heart of the series, having appeared in all but one movie. Universal Studios acknowledged Walker’s contributions to the franchise by announcing that a portion of the proceeds from the Blu-ray, DVD and digital releases of “Fast & Furious 6” will be donated to Reach Out WorldWide, a non-profit organization the actor founded. Because Walker died in a fiery auto accident, it may be difficult for fans to watch him racing the high-end automobiles that have played such a huge role in each of the movies. However, those able to get past the suddenly eerie aspect of Walker’s hot rodding images, should see “Fast & Furious 6” for what it is: one of the better entries in the pulpy-yet-nonetheless enjoyable series. The “Fast & Furious” movies have always been a guilty pleasure and “6” begins where “Fast Five” left off. Dominic Toretto (Vin Diesel) and his crew of fast-driving car nuts have mostly retired from their criminal lives, but their former exploits have forced them to live in exile. They team up again when Diplomatic Security Service agent Luke Hobbs (Dwayne Johnson) asks them to help nab a dangerous mercenary who appears to be even more skilled at motorized hijackings than they were. Hobbs sweetens the pot by telling Dominic that his entire crew will receive amnesty if they help. Even more importantly, Hobbs tells Dominic that his former girlfriend, the supposedly deceased Letty Ortiz (Michelle Rodriguez), is working with the bad guys. Dominic’s crew is made up of former FBI agent Brian O’Conner (Walker) and their fast-driving pals Tej Parker (Chris “Ludacris” Bridges), Han Seoul-Oh (Sung Kang), Gisele Yashar (Gal Gadot) and Roman Pearce (Tyrese Gibson). Along with Hobbs, they face off against the mercenary and find that he is, indeed, a worthy adversary. The plotting in “Fast & Furious 6” is ridiculous, and the dialogue and storytelling are melodramatic. If the audience for these movies actually cared about such things, they would represent a serious problem. But the “Fast & Furious” movies aren’t about realism and strong characterization. They are an excuse for fans to revel in mostly impossible stunts while nurturing a love affair with fast cars. Director Justin Lin makes sure that “Fast & Furious 6” features countless chases, including some of the best automotive stunts ever presented on screen. Knowing that Walker died in a vehicle that would have felt at home in the movie takes much of the joy out of watching, but it doesn’t change the film’s status as a fast-moving action flick that gives fans exactly what they asked for. DVD and Blu-ray extras include five making-of featurettes, deleted scenes and an audio commentary by Lin. Martin Scorsese’s World Cinema Project: In 2007, director Martin Scorsese founded the World Cinema Foundation, an organization dedicated to the “preservation and restoration of neglected films around the world.” Since the Criterion Collection has long been a frontrunner in the presentation of important movies, it makes sense that the two organizations would team. With its World Cinema Project boxed set, Criterion offers small-screen releases of six movies restored by Scorsese’s foundation. Included are “Touki Bouki” (Senegal, 1973), “Redes” (Mexico, 1936), “A River Called Titas” (India/Bangladesh, 1973), “Dry Summer” (Turkey, 1964), “Trances” (Morocco, 1981) and “The Housemaid” (South Korea, 1960). “Adore”: Drama about long-time friends (Naomi Watts and Robin Wright) who begin sexual relationships with each other’s sons. Directed by Anne Fontaine. “Touchy Feely”: Dramedy focused on the lives of two siblings. One (Rosemarie DeWitt) is a popular massage therapist who spirals into crisis when she develops an aversion to touch. The other, (Josh Pais) is a dentist whose once-failing practice suddenly thrives. Allison Janney, Ron Livingston, Scoot McNairy and Ellen Page also star. Written and directed by Lynn Shelton. “Battle of the Year”: Story of an underdog, American breakdancing team and its attempts to win the international Battle of the Year. Josh Holloway, Chris Brown, Laz Alonso, Caity Lotz and Josh Peck star. Directed by Benson Lee. “Jayne Mansfield’s Car”: This drama – written, directed and starring Billy Bob Thornton – presents the story of two clashing families that come together for a funeral. Along with Thornton, the film stars Tippi Hedren, Kevin Bacon, Ray Stevenson, Robert Patrick, Robert Duvall, John Hurt and Frances O’Connor. “Grey Gardens” on Blu-ray: High-definition release of the 1975 documentary film about Edith Bouvier Beale and her daughter, Edie. Beale was the aunt of U.S. First Lady Jacqueline Kennedy Onassis, yet she and her daughter lived in a broken-down mansion in relative squalor for decades. Although the film was previously available on DVD, the Blu-ray release – by Criterion Collection – features a fresh, 2K digital restoration approved by co-director Albert Maysles. “The Game” – The Sixth Season: Twenty-two recent episodes of the BET drama about the personal lives of people with ties to a professional football team. The seventh season of the show won’t debut until March, giving viewers plenty of time to catch up. “Futurama” – Volume 8: Final 13 episodes of the Matt Groening-created animated series about Earth citizens living in the 31st century. For fans who don’t own previous releases, 20th Century Fox is also selling a Complete Series Gift Set that includes all 124 episodes. “The Gene Autry Show”: The Complete Television Series: Timeless Media Group delivers every episode of Gene Autry’s 1950s television series about the adventures of a singing cowboy. The 15-DVD boxed set also has a number of extras, including 10 episodes of other Western series produced by Autry’s Flying A Pictures. – Forrest Hartman is an independent film critic whose byline has appeared in some of the nation’s largest publications.